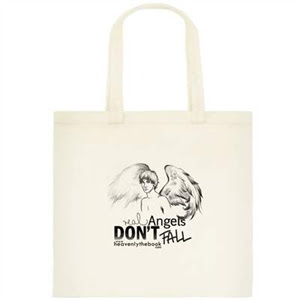 Jennifer donated an awesome tote bag from her Heavenly Series as well as a huge of pile of swag including a music CD, postcards and bookmarks. Jessica Day George signed some bookplates for our readers and the other authors chipped in signed bookmarks. 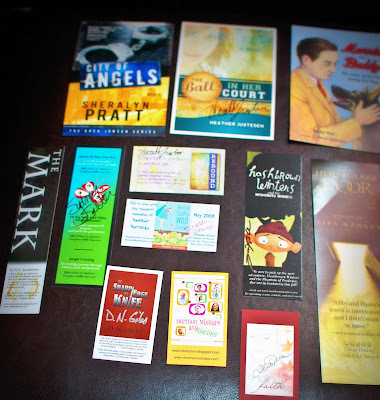 To enter to win some Authorpalooza swag comment below. I’ll pick three winners. Giveaway is open internationally! Ends November 17, 2011. View all the photos from the event on Heather Gardner Photography’s Facebook page. Sydney Salter –Swoon At Your Own Risk – YA Fiction…currently reading now! 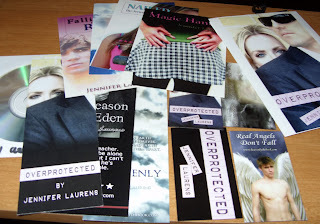 We are giving away author signed bookmarks. To enter to win: simply comment below with the book or author which interests you most. Contest Ends October 20, 2010 and is open internationally. Contest ends March 8th 2010, Good Luck!